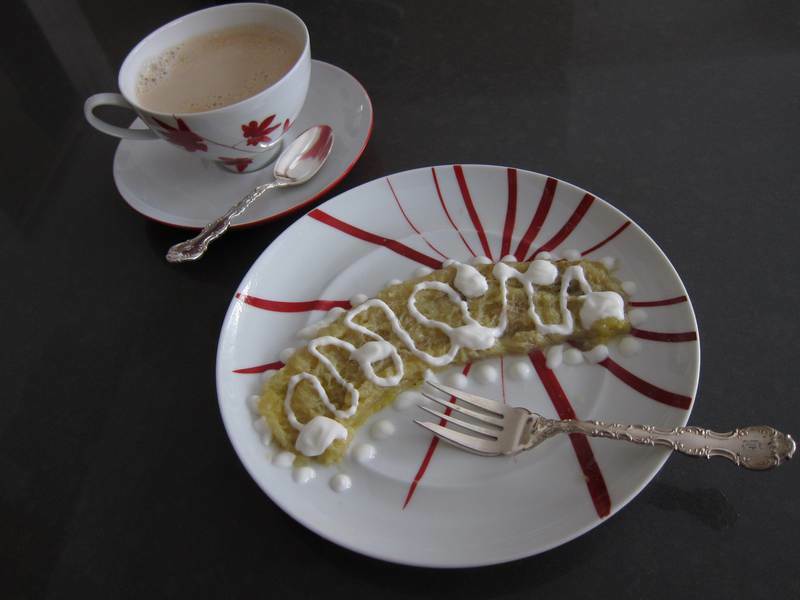 Baked Banana – Bravo for a 2 minute dessert! Happy 50th Jittery Cook post! Your positive response fuels the Jittery Cook blog. Research shows that there are ingredients that could theoretically be combined into 10 quadrillion recipes — of which only one million, just .0000001%, have already been recorded. So between the already recorded recipes and the ones yet to be created, Jittery Cook may have enough raw material to keep going indefinitely. Many years ago an elderly gentleman shared this Baked Banana recipe with me, and I’ve been enjoying it ever since. It is more of an idea than a recipe, but it tastes so good, I couldn’t resist sharing. 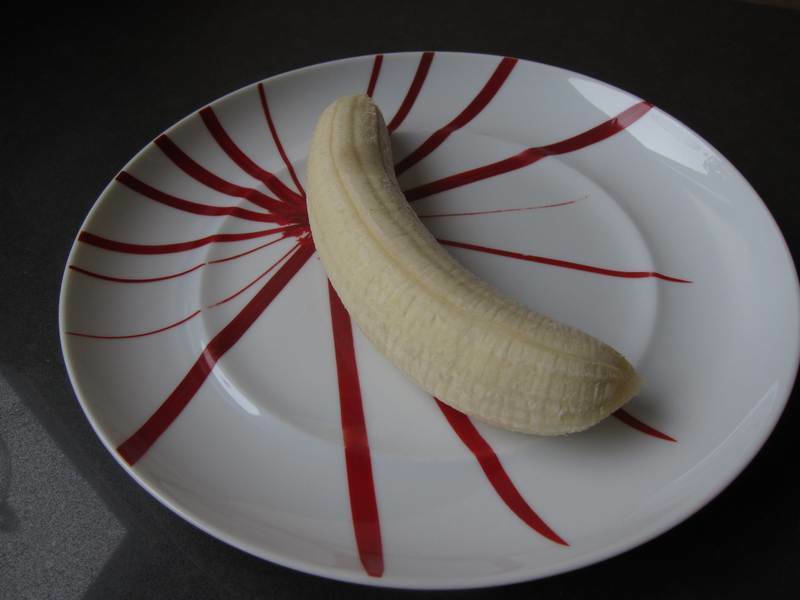 Place the banana in the microwave on a plate. Cover it with a splatter guard or loosely with a paper towel. Cook for 1 1/2 to 2 minutes, until deflated. Carefully remove from the microwave using an oven mitt. Serve hot, bathed in its own juices, for dessert or as a snack, with your preferred yogurt. This is merely the third Jittery Cook dessert to date. The ingredients are healthy, so there is no need for post-dessert regret. Thank you to my good friend and coworker, Cheryl Weiss, for tipping me off to using a baggie to pipe yogourt. Greek Giant Lima Beans – Addictive! Eggplant Parmigiana – Rome wasn’t built in a day! Bananas and oranges are the only fruit that I eat. What a great recipe. Does your recipe include the pretty dinnerware. 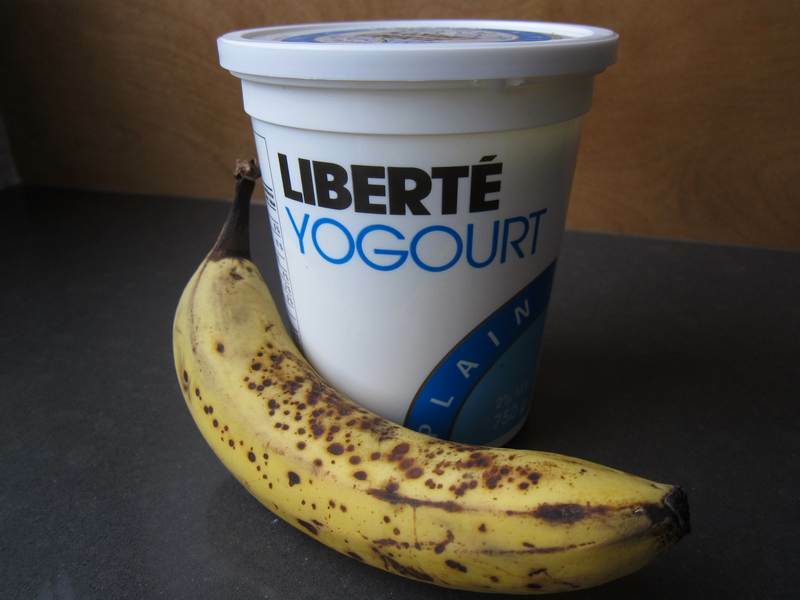 Is that yoghurt you have spread over the banana? Hope you like how it tastes. Dinnerware not included. Yes, that is yogourt piped onto the baked banana. I smiled at your banana post- it’s a healthy version of what my mom would give me as a favorite snack when I was little in the Bronx: sliced bananas with sour cream and a touch of sugar… I will peruse all your recipes including your favorites… have been meaning to try fresh ricotta- you just may have inspired me-thank you and Happy Chanukah! ps will cook for your daughter anytime! My mom gave us sliced bananas with sour cream too. No one I knew ate yogourt in those days. I forwarded my NY daughter your comment. I hope you two meet. Come visit Montreal and we can plan a duo post.